The 27th Beiteddine Art Festival kicked off on 28 June with Kan Ya Ma Kan (Once Upon a Time), a performance by the Caracalla Dance Theatre. Lebanon holds many artistic marvels, and the annual Beiteddine Art Festival – hosted in the 19thcentury architectural marvel of Beiteddine Palace, situated in the Chouf Mountains, 45 km southeast of Beirut – is one of its biggest cultural events, attracting local and international audiences. Severely damaged during the civil war, the palace was restored on the request of Walid Jumblatt, the prominent political figure. In 1985, Jumblatt initiated artistic activities in the Palace’s premises for the Lebanese political and cultural creme-de-la creme. In 1987, his wife, Nora Jubmblatt – today the festival’s president – took the initiative onto a higher level, placing it on the international map and so opening doors to wider audiences. In the months of July and August, the festival presents renowned Lebanese and international artists: musicians, dance troupes performing classical, modern, folklore and other shows. In parallel, photography and art exhibitions are held in The Stables surrounding Al Midan, a large courtyard. The Kirov Opera conducted by Valery Gergiev, the Palestine Youth Orchestra that accompanied Marcel Khalifeh tribute to Mahmoud Darwish, Il Divo, Elton John, Fairouz, Ziad Rahbani, UB40, Jose Carreras, Andrea Bocelli, Al Qawwali, Montserrat Cabbale (who performed with the Cairo Opera Orchestra) and the Sahara band are among dozens who have performed in the festival. The 27th Beiteddine Art Festival kicked off on 28 June and will continue until 28 July. The festival opened with Kan Ya Ma Kan (Once Upon a Time), a performance by the Caracalla Dance Theatre. The festival continues with a contemporary dance performance by Sylvie Guillem, a concert by the master of Qudood Halabiya, Hamam Khairy; a jazz concert by the Dizzy Gillespie All-Star Big Band featuring one Lebanese singer, Randa Ghossoub; and Opera La Bohème, a co-production with Les Chorégies d’Oranges. In addition, two exhibitions are held: Samir Sayegh’s Yawmiyat Horriya (Days of Freedom), a calligraphy exhibition on the subject of freedom voiced by the Arab Spring, and photography works by Göksin Sipahioglu, founder of the Sipa press agency, displaying touching and often shocking photographs from conflict areas around the world. Kan Ya Ma Kan (Once Upon a Time), initially planned to be performed on three consecutive nights – 28, 29 and 30 June – was such a great success the festival organisers decided to add one extra night on 1 July. It is important to note that as per the festival’s tradition some events reach audiences who might be unable to afford the tickets. Kan Ya Ma Kan‘s general rehearsal that took place on 27 June was open to the public and witnessed over 3,000 people, large families with children from all social strata, filling the main auditorium at Al Midan, enjoying the opportunity to see the almost finalised mega production by the world-renowned Lebanese troupe. Kan Ya Ma Kan consists of three segments: Shehrayar (to the famous Scheherazade symphonic suite by Nicolai Rimsky-Korsakov); Aswaq Ayam Zaman (The Marketplaces of the Old Days), which retells the stories from A Thousand and One Nights to Maurice Ravel’s Bolero arranged and expanded by the Iranian composer Mohammad Reza Aligholi; and the Beiteddine Evening, which took the audience through the Lebanese folklore, national heritage, customs and popular songs by stars like Hoda Haddad, Joseph Azar and others to the rich orchestration of the folkloric themes by Egyptian composer and conductor Hisham Gabr. All three segments were directed by Ivan Caracalla and choreographed by Alissar Caracalla. For the first time in its history, the Caracalla Dance Theatre performed to a live orchestra: the Lebanese Philharmonic Orchestra conducted by Harout Fazlian. The Caracalla Dance Theatre was founded by Abdel Halim Caracalla in the 1970s and it is the only internationally renowned theatrical dance troupe in the Arab world that sustains Arab heritage in a modernised context. The grandeur of its performances, its innovation of form and style, professionalism and perfection, have developed a unique Caracalla style has captivated audiences all over the world for four decades. Abdel Halim Caracalla comes from the historic and artistic Lebanese town, Baalbeck; he never tires of speaking about his “obligation to art”, In the 1960s Caracalla studied with Martha Graham in New York; he also studied theatre in Paris and London before founding his own troupe. 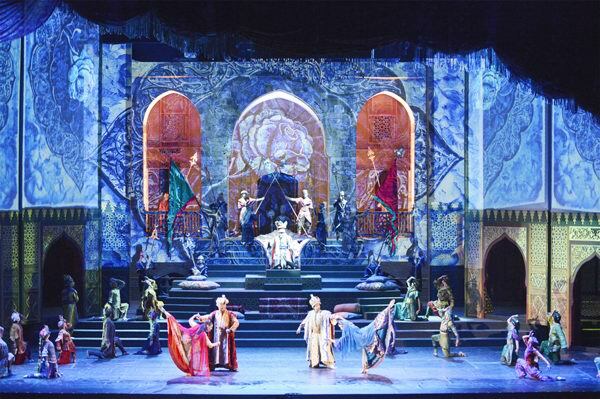 Not only did the Caracalla Dance Theatre attract international audiences, it also generated the interest of Arab leaders who saw in it an important promotion of Arab arts and an opportunity for international cooperation. Caracalla’s performances, which have toured the word, are held regularly in Lebanon and have participated many times in the Baalbeck International Festival. Many are charmed by the unique magic presented by the ballet, dance and theatre performances created by Caracalla. In his One-on-One interview with Riz Khan on Al Jazeera (2009), Abdel Halim Caracalla revealed that the secret of that magic lies in his attempts to combine Eastern and Western values in one language, resulting from his profound research into Arab culture, which he pursues during his extensive travels around the Arab world and beyond. “I take notes, I record thousands of songs… to know our [Arab] identity. I don’t want to create a ballet without knowing who we are,” Caracalla says in the interview, adding that the once great Arab civilisation is still present in the Arab heritage and in its people. His research has helped him discover many hidden treasures. One of the core reasons behind the troupe’s success is Caracalla’s ability to create a unique blend combining classical, modern and Arab dance styles. Today his vision is carried on by his son, Ivan Caracalla, the troupe’s present director, and his daughter, Alissar Caracalla, its choreographer. While the company continues to present performances that remain faithful to its vision and aesthetically strict demands, both siblings bring a fresh spirit to the performances. No doubt, a sense of magic accompanied Kan Ya Ma Kan as well. The Beiteddine Palace, built by Emir Bechir Chehab II (1767–1850) is located 900 metres above sea level, around a small Muslim-Druze community, overlooking a terraced mountainside. The fountains, Turkish baths, arcades, stepped galleries, numerous courtyards, mandaloun balconies closed in by intricate woodwork, coloured windows, multicoloured mosaics and palace gardens all contribute to the harmonious beauty of the whole complex. And, inspired by it, Ivan Caracalla incorporated the palace architecture into the show. Throughout the three segments of Kan Ya Ma Kan, grand and splendid decor transported the audience into the enchanting culture of the Arab world. Paintings depicting Oriental scenery and videos creating an additional visual narration, were projected on the palace walls and the panels placed on the stage. The brilliant scenography at times invited the spectators into the palace’s rooms and corridors, at other times presented the marketplace. Rather than limiting the show, the architectural blocks of Beiteddine became tools incorporated into the artistic vision. In Kan Ya Ma Kan, all the artistic elements – ballet, classical, modern and Oriental dance, scenography, costumes, even the architecture itself – combined with additional effects to serve one unified purpose, melting into one powerful image. In her turn, Alissar Caracalla’s potent choreography was radiantly executed by the breath-taking dancers, and the ballet soloists shone with unprecedented talent and industry. On the thematic level, both Ivan and Alissar offered new concepts. King Shehrayar, obsessed with his love for Scheherazade, is troubled by constant confrontations with his shadow. In this interpretation, Scheherazade dies, giving a completely new level to the story. One of the most powerful scenes in this segment was a duet between Shehrayar and Scheherazade filled with an enormous emotional charge. In the second segment, Ravel’s Bolero presented very challenging material to the choreographer since the piece has been used by a multitude of dance troupes. The Caracallas decided to adapt the music to Oriental scenery, inviting the audience to an Arab souk. The crescendo was reflected in an increase in the number of dancers on the stage and a growing dynamism of group numbers. The third and final segment of the show, Beiteddine Evening, transported the audience to purely Lebanese traditions. Songs accompanied by traditional Lebanese dances with a modern twist made the audience ecstatic. 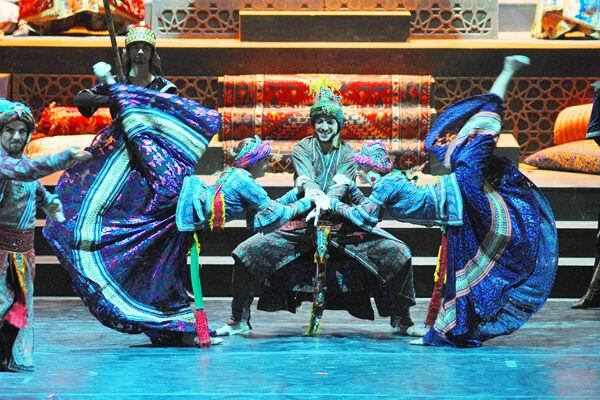 Though the material is deeply rooted in the local cultural heritage, the mise-en-scene, choreography and orchestration of the folkloric motifs, gave the performance a much broader perspective. Despite the large number of artists on stage, each dancer was an important and independent unit contributing to an artistic whole. The group dances, duos or trios, and additional scenes presented in stage corners – all served one cohesive artistic vision. The rich scenography and costumes, choreography, lights, effects and music testified to the incredibly hard work of the whole team – yet another success of the Caracalla Dance Theatre.